I got a birthday present this year and I didn’t even know it. On February 9, 2019, just in time for me to enter that next phase in my life – the one that starts with a 4 – the members of a new project group, 1the9 were announced. This group, formed by participants in a survival program called Under Nineteen are just that…under nineteen. Ouch. Babies. The show started with 57 trainees and narrowed it down to the 9 that will be part of this group for a 12 month period. Just long enough for us to fall head over heels for the group as a whole and then feel super sad when they go back to their management agencies and get shuffled into new groups or debut as solo artists (and one inevitably has to sue his management company for some sort of breach of contract and one decides that he just wants to be an actor). It doesn’t mean it hurts any less, but we’ve gotten good at these types of groups now. Or at least we have prior experience to lean on. 1the9, pronounced Wonder9, is promoting under MBK Entertainment and they seemed to have learned under past experience as well. Announced on February 9, the group debuted on April 13 – only two months later – giving them ten months to promote and release a few more eps, grow a large fanbase, and make some money. 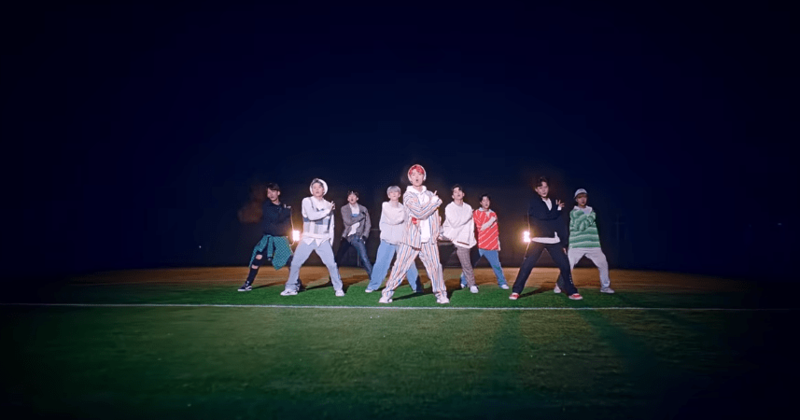 Though the official debut was on April 13 with Spotlight, the members released a little pre-debut diddy, Domino, featuring Crush that set my expectations for everything they do over the next fraction of year at a pretty high bar. Poor 1the9 has made things very hard for themselves with this song – it’s sooooooo good. Now I can’t wait to see what this season of Produce gives us…the contract for that project group – name to be determined as the season hasn’t even debuted yet – is supposed to be in the neighborhood of 3 years. Question. How on earth do they get Wonder9?